Harriet Palmer, New Zealand Tree Grower August 2018. Farm foresters can now test out different management options for existing or planned radiata pine plantations with a new on-line calculator – the Forecaster Radiata Pine Calculator. This is a combined initiative from Scion and the Forest Growers Levy Trust and has been designed with the small-scale forest in mind. The real value to farm foresters is that the calculator should get people thinking about their options. The calculator is free, will work on any computerised device, and can be found on the Forest Growers Research website at www.fgr.nz. First-time users are required to register, a relatively simple process, and then you should be able to get started. 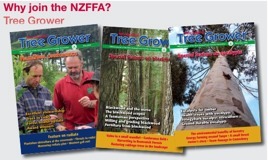 Growers can pinpoint their own forest or land on a map, or for that matter any other land in New Zealand. From here the programme will automatically upload standard information about the site’s potential productivity using standard forestry indices such as Site Index, which is an index of site quality based on height growth, and the 300 Index − an index of site quality based on stem volume growth. Residual stems per hectare following thinning. Rotation length can be varied, providing growers with information about the financial and yield implications of bringing forward or delaying harvest. Once all silvicultural data for any given trial run has been entered, the programme quickly runs a simulation and provides a series of results. Four different options are produced for each simulation and are available online or as downloadable pdfs. The results contain a range of data and financial information. They give a basic picture of the growth of the crop and its value at harvest in terms of the proportion of different log types and their respective values. Log prices used in the calculations are current and users should note that there is no discounting related to rotation length.The values are gross rather than nett values, so before getting too excited about the bottom line, remember that harvesting and transport costs will need to be subtracted. Other financial data on which the results are based are industry standards and will be updated as and when necessary. The results have been designed to be easy to interpret and the first two – log yield and annual crop condition – are the most useful for an initial and very simple comparison of options. Some examples are shown below.A comparison of the tables provides an indication of how a 27-year-old pruned regime compares with a trees not pruned in terms of log yields and value at today’s prices. Scion’s developers emphasise that the calculator has been designed to be an early decision-support method for small-scale forest owners. It does not replace expert advice and pre-harvest inventory. However, the discussions which the owner of a small forest might have with a forestry consultant will be better informed if the owner uses the calculator for a few trial runs looking at different options. They could reveal some opportunities which might not otherwise have been considered. 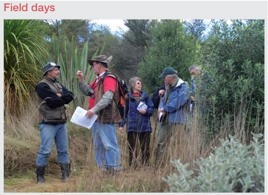 The calculator is a much-updated version of the original spreadsheet radiata pine calculator developed by the late Leith Knowles, who many NZFFA members will remember fondly. Leith also developed a Douglas fir calculator. An on-line version of a new Douglas fir calculator has also been developed. Unfortunately, so far there is no GIS facility for Douglas fir available in the calculator so users need to know the 500 Index for their site, but a local forestry consultant may be able to advise on this. The figure can be entered manually and the calculator will then work in the same way as for radiata pine.